Welcome to your Interstate 275 Resource in the Tampa Bay Region! Whether you are a seasoned roadgeek or a casual surfer, or whether you are a resident of the Tampa/St. Petersburg metropolitan area or elsewhere throughout the world, welcome to the website of all things Interstate 275 in the Tampa Bay region! Since 2003, this website is dedicated to the 59 miles of Interstate 275 that runs through Tampa and St. Petersburg. We cover all the exits from FL 56 at the Hillsborough-Pasco county line in Wesley Chapel as well as Bearss Avenue, Fowler Avenue, Interstate 4, Dale Mabry Highway and FL 60 in Tampa to 4 St N, Gandy Blvd., 38 Av N, the downtown St. Petersburg feeders of Interstates 375 and 175, 22 Av S, 54 Av S/US 19 and Pinellas Point Drive in St. Petersburg as well as US 41 and back at Interstate 75 in Manatee County. We also cover the two major bridges on Interstate 275 in the Tampa Bay region, the Howard Frankland Bridge and the Sunshine Skyway Bridge. After all, the Sunshine Skyway Bridge has a lot of history to it for your reading pleasure! As Interstate 275 Florida covers the Tampa Bay region, it is divided into many sections for your virtual riding pleasure! Here we cover Interstate 275 in Tampa from its northern terminus at FL 56 on the Hillsborough-Pasco county line in Wesley Chapel through downtown Tampa and the infamous "malfunction junction" at Interstate 4 to FL 60 and the exit to the World's Finest Airport, Tampa International Airport. Traversing through the Sunshine City of St. Petersburg, we cover Interstate 275 from FL 687/4 St N through downtown St. Petersburg including the two interstates that feed into downtown St. Petersburg, Interstate 375 and Interstate 175 to Pinellas Point Dr S and the northern entrance to the Sunshine Skyway Bridge. From the southern entrance of the Sunshine Skyway Bridge, Interstate 275 makes its grand finish from US 19 and across US 41 all the way to Interstate 275's southern terminus at Interstate 75 north of Ellenton and west of Parrish. Two major bridges in the Tampa Bay region carry Interstate 275: The Howard Frankland and the Sunshine Skyway. The Howard Frankland Bridge carried Interstate 275 traffic from its original opening in 1960 when the Howard Frankland carried Interstate 4, while the Sunshine Skyway has a lot of history to it from its beginnings as a two lane cantilever through truss span carrying US 19 to the Sunshine Skyway we know today as an integral part of Interstate 275. A page on Interstate275Florida.com dedicated to the World's Finest Airport, which can be reached from Exit 39 (FL 60). We have helpful travel tips for our visitors arriving into Tampa International Airport to help you plan your next vacation to the Tampa Bay region including the Pinellas Suncoast. The Tampa Bay region has so many highways including Interstate 275. Despite so many widenings that have taken place, Interstate 275 gets jam packed both during and (increasingly) outside the morning and evening commutes. Unfortunately, the Tampa Bay region lacks a good mass transit system despite the fact we have HARTline (Hillsborough Area Regional Transit) and PSTA (Pinellas Suncoast Transit Authority). The answer is right here! Everything you always wanted to know about Interstate 275 in the Tampa Bay region but were afraid to ask! Also plenty of odds and ends Interstate 275 in the Tampa Bay region too. Also quick reference exit lists and a list of links of interest for your reading enjoyment. Know the difference between the official and unofficial Florida Welcome Center. This is presented as a service for our Interstate275Florida.com visitors. More stuff on Interstate 275 in the Tampa Bay region than what we can keep up on the website. Take me to the blog! The legalese of Interstate275Florida.com as it relates to the use of our website. Got questions? Comments? Suggestions for new content? You have come to the right place! 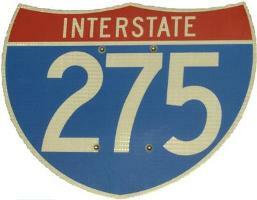 You have arrived at the website of all things Interstate 275 in the Tampa Bay region! Everything you always wanted to know about Interstate 275 that goes through St. Petersburg and Tampa is right here! Interstate275Florida.com is part of the Edward Ringwald Websites Network.